Pope Francis blessed the 2016 Easter Season with his new Apostolic Exhortation on the Family, Amoris Laetitia (The Joy of Love). The second Apostolic Exhortation of Pope Francis was published on April 8, 2016. Amoris Laetitia (The Joy of Love) is Pope Francis’ Post-Synodal Apostolic Exhortation on Love in the Family. I am deeply grateful to Pope Francis for the teaching and pastoral care he has provided the Church and all people in his apostolic exhortation, Amoris Laetitia (The Joy of Love). The depth and breadth of this teaching on love in the family, which follows the recent Synod on the Family, is extensive, and I urge all Catholics and everyone to heed the pope’s suggestion and to study the document in the weeks and months ahead. In the opening lines of this love letter to families, the pope states that “The joy of love experienced by families is also the joy of the Church.” Pope Francis set the tone for his teaching document by reminding the Church and all people of the great joy and grace that are experienced in marriage and within families. He also provides a context for the entire Church — bishops, priests, religious, lay leaders and families themselves — to meet the very real challenges facing marriage and the family today. The pope does not sidestep the challenges and he has invited all of us to meet them with a spirit of love. “The Joy of Love” is a document of hope. It reminds us of the great blessing married couples and families bestow on all of society. Precisely because the health of marriage and families are so important to the wellbeing of society, this document deserves careful consideration to determine how its teaching can be implemented for the common good. The pope’s words should inspire all of us, especially married couples, to grow in love and to see marriage and family life as a mission of love in service to the world. In the months ahead, we will be studying the Pope’s pastoral exhortation to discern how on the archdiocesan and parish level we should be strengthening and improving the pastoral care we give to couples as they prepare for marriage, as they seek to deepen their married love through the years, as they care for their children, and as they face difficulties in their marriage. Pope Francis has given us a teaching of Hope in God’s grace and mercy in all of life’s joys and challenges. America Media’s editors, including Father James Martin, S.J., editor at large, offer five takeaways from Pope Francis’ apostolic exhortation on the family, Amoris Laetitia. To learn more, download the following resources. In his encyclical letter, Laudato Si, Pope Francis has put a human face on the issue of ecology and caring for creation. This teaching document, which is consistent with the teaching of his predecessor, Pope Benedict XVI and other recent popes, is an urgent call to Christians, people of other faith traditions and those of no faith to protect our earthly home and our brothers and sisters who inhabit it. As the title makes clear, the pope’s letter praises God for the gift of creation and reminds us that every human person is a part of creation, with inherent dignity and deserving of our respect and care. To understand this better we need, as Pope Francis states, an “integral ecology” that recognizes the relationship not only between human beings and nature, but also with God, with ourselves and other human beings. We here in the Northwest live in an area of incredible natural diversity and beauty, so we are especially grateful to the Holy Father for raising awareness about the need to “care for our common home.” We should also be mindful that his encyclical letter challenges us to recognize that our individual decisions often have far-reaching consequences for the natural world and for other people, most especially the poor. As we answer the pope’s call to action, I urge everyone to join with him in giving grateful praise to our loving God for the great gift of creation. 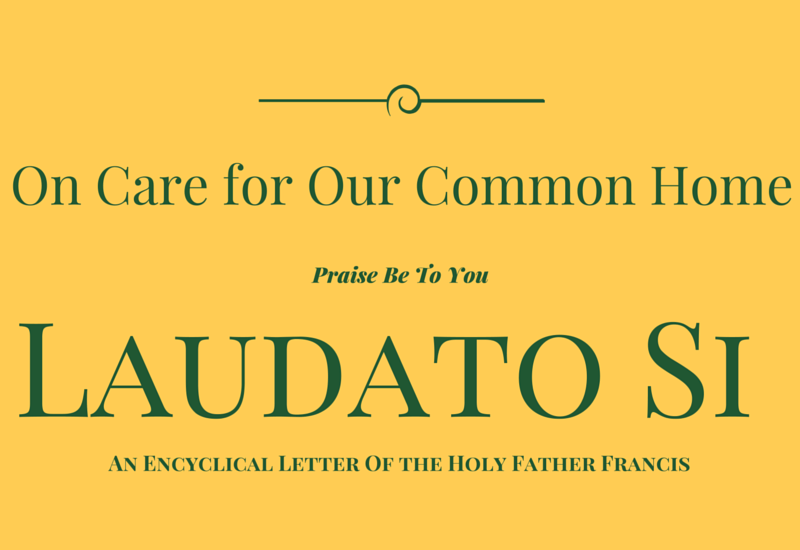 Laudato Si, Italian for “Praise Be to You,” is the second encyclical from Pope Francis after Lumen fidei (“Light of Faith”), which was released in 2013. The encyclical on the environment has the subtitle, On Care For Our Common Home. We mapped it! Laudato Si: A Map of the Encyclical Letter will help you navigate the text more easily. This document is a useful guide for an initial reading of the Encyclical. It will help you to grasp the overall development and identify the basic themes. The first two pages are an overview of Laudato Si (literally “Be praised” or better, “Praise be to you”). Then for each of the six chapters, there is a one-page summary that gives the argument or main points and some key passages. The numbers in parentheses refer to the paragraphs in the Encyclical. The last two pages are the table of contents. The Extraordinary Jubilee of Mercy (Latin: Iubilaeum Extraordinarium Misericordiae) is a Roman Catholic period of prayer held from the Feast of the Immaculate Conception (December 8), 2015 to the Feast of Christ the King (November 20), 2016. Like previous jubilees, it is seen by the Church as a period for remission of sins and universal pardon focusing particularly on God’s forgiveness and mercy. It is an extraordinary Jubilee because it had not been predetermined long before; usually ordinary jubilees take place every 25 years. The 2016 Jubilee was first announced by Pope Francis on March 13, 2015. It was declared in the Pope’s April 2015 papal bull of indiction, Misericordiae Vultus (Latin: “The Face of Mercy”). It is the 27th holy year in history, following the ordinary 2000 Jubilee during John Paul II papacy. The opening day was also the fiftieth anniversary of the closing of the Second Vatican Council. Archbishop Sartain shares his reflection in a three-part series on the spiritual and corporal works of mercy. The Pontiff’s wish is that the Jubilee be celebrated not only in Rome but all around the world. For the first time, holy doors are being opened in single dioceses, either in the main cathedral or in local historical churches. The first holy door was opened by Pope Francis in Bangui on November 29, 2015 during a tour of East Africa. The Holy Door represents the compassion, love, mercy, and consolation of God working in our lives. Archbishop Sartain has designated St. James Cathedral’s great bronze doors, covered in depictions of stories of God’s mercy, as the Door of Mercy for this Jubilee and has invited parishes to set up visits for the Year of Mercy, which can be just a time of prayer and pilgrimage or can include a guided tour as well. ​Father Joseph Corpora, CSC, a Missionary of Mercy appointed by Pope Francis, has been invited to the Archdiocese of Seattle by Archbishop Sartain to make a Mission of Mercy from September 30, 2016 – October 2, 2016. Archbishop Sartain noted that “the main focus of the Missionaries of Mercy, as he was informed in Rome, is to hear confessions.” With that mandate, Fr. Corpora will celebrate the sacrament of reconciliation and penance at each event. Learn more about Fr. Corpora’s Mission of Mercy in the news article Being Mercy: He Can’t Take His Eyes Off Us, published by Notre Dame Magazine.